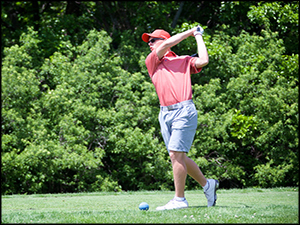 The Rose Hill Golf team would start off the year at the Andover Invitational, in which the team would get a very slow start as this would be their second lowest finish of the year in which was a tough invitational. The team would take a second place finish in the Augusta Invitational only two weeks later which would spark one of the best seasons golf has seen in recent memory. The team would be led by seniors Broc Heiskell, Jonah Robson, And State Placer Peyton Austin. Broc would have one of his best seasons of his High School career as he would place top 15 on multiple occasions. Peyton Austin would get multiple victories this year as he would claw his way back to state one more time to compete for the title. Austin would finish 8th at state, and would come home with some hardware for his accomplishment. The Rose Hill Golf team will be losing alot of seniors but hopes to continue the winning tradition they strived for this year. The 2018 Lady Rocket Softball team has reached a conclusion to their season this week. Over the past 3 months they have fought hard to improve and try and take a shot at state. 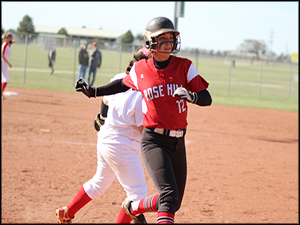 The season began in mid March, resulting in a 2-2 record after the first two double headers for the softball team. In the weeks to come the Rockets would be swept only twice before going on an eleven game win streak. The Lady Rockets played well all season and the hard work paid off, the Rockets played two games in Regional play for the first time since 2015. 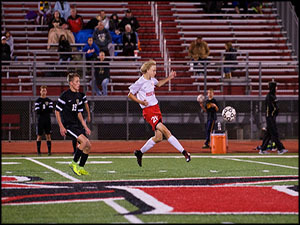 As last season ended and this season began the Rockets had hopes of going to state for the first time since 2014, however this goal came short. Despite not quite achieving the goal they wanted, they successfully went back to back with two, positive win to loss records in a season. As this year’s nine seniors leave the Rockets will have to work even harder over the offseason if they have any intention of making an appearance at state next year. With the number of underclassmen in the program, next year will be a test for them and the experience they have gained. Thank you to all the seniors and the work that they put in to making Rose Hill better, on and off the field. The Lady Rockets swim team would be pushed hard this year as coach Tessa Downs was expecting a big year from multiple returning swimmers along with a lot of talented newcomers joining the team. The year would start off slow for the Lady Rockets but it would eventually pick up as the Rockets would place 4th in back to back meets and they would only continue to improve from there. Dakota Bastin would be a huge part of the team placing so highly as she would take 1st in the 500 Freestyle multiple times, she would also help propel the 400 Freestyle relay to a state appearance. Sarah Sissel would also help the team as she would be a huge part of the teams shorter distance races, as she would qualify for state in the 50 Free and the 100 Free. She would also help propel the 200 and 400 Freestyle Relay to state. All Around this year for the Lady Rockets Swim team was a success and next year looks to be even better with a lot of returning swimmers. The 2018 Rocket Track Team was very young, with many skilled freshman. Even so, the Rockets will now lose several veterans such as JJ Carney and Emily Witt, who have competed at the state track meet several times throughout their 4 year track careers. Both of their talents combined this season for a year that makes the future look very bright for Coach Barger. With very talented freshman girls as runners and freshman boys as throwers on the team, who have been coached up by fantastic, experienced athletes, is a great sign for the Rockets track team in the future. There where many PRs this year by a wide variety of athletes, from throwers to distance runners. The 2019 Rocket Track Team looks to pick up right where this season left off. 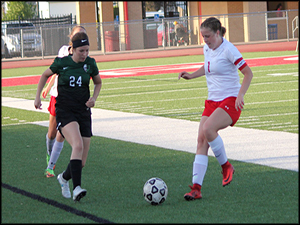 Monday marked the end of the 2018 soccer team’s hopes of going to state. The lady Rockets travelled down to TMp to compete at AVCTL Division IV Regionals. Unfortunately the ladies fell short and fell to TMp 2-4, this defeat ended the season and killed any dreams of going to state. 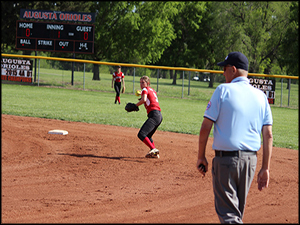 However losing in Regionals was only one part of the season, as the season progressed they experienced highs and lows ranging from wins and close losses. The lady Rockets battled hard every minute of the season, and they fought hard to win even at the end. The Lady Rockets were able to scrap together a record of 3-13 winning more than they had in the past season. The Rockets were unable to put up a winning season for the past 4 years; and as the offseason approaches the lady Rockets will have to fight to change that. Thank you to all of the seniors who showed excellence on and off of the field, and good luck as you go on in life. 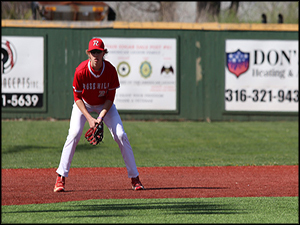 The Rose Hill Baseball had a very tough season this year. Starting off the year the team had a good amount of players tryout and some of those look to be young future talent. The Rockets started the season against a older Circle team. The first game was a close one but not so much for the second one. They had high hopes for a good season, who knew they wouldn’t win a single game in the season. The Rocket baseball team had very few close games, in their 21 played games only five of those were losses within three runs. The team batting average ended at .191 with 179 strikeouts and scored 46 runs all season. The team also accounted for 104 errors with a 6.170 team ERA. When you put all these statistics together you can easily see why the team was unable to produce a win. The team graduated their seven seniors consisting of Travis Bilson, Ben Black, Garrett Guinn, Nathan Ast, Zeb Bradley, Jarrett Grier, and Aaron Moore. Each of these seven showed great leadership characteristics, pride in the team, and always looked to better themselves as well as their teammates around them. It might have been a rough year, but the team will surely miss each of these guys. 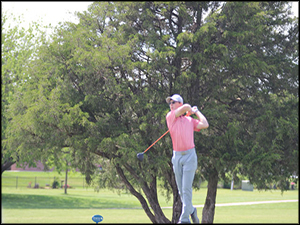 Senior Peyton Austin will bring experience as a State Medalist to the Rocket Golf team as he leads a varsity team that only lost one golfer to graduation after last season. 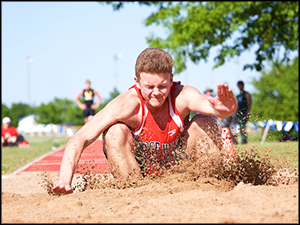 At last year’s State Meet, Austin finished in a three-way tie for first place but then lost the playoff and finished with the bronze medal. 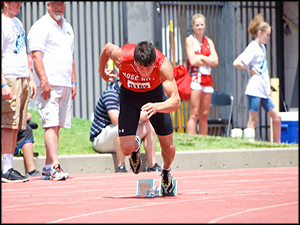 He will look to improve on that finish this season as he chases an individual State Title. Senior Jonah Robson, Senior Broc Heiskell and sophomore Noah Locke all return with varsity experience and hope to improve their games enough to help the Rockets qualify for the State Meet. Their first meet will be in Andover at Crestview on April 2. The team has high hopes for the season, having three senior leaders with varsity experience to push the team to their full extent. As the 2018 Track season approaches, the boys team looks to have a lot of potential talent. The team roster consists of a total of 13 upperclassmen, including 8 seniors. The girls’ team, however, only consists of 8 upperclassmen with 4 seniors. The boys and girls teams will open the season by hosting the Early Bird Meet, their only home meet for the season. The boys team returns all 5 state qualifiers from 2017, including the 4x100m team (Cody Wallis, JJ Carney, Dylan Sapp, and Travis Jones) and Senior Braden Bischler, who qualified for State in the shot put last year. As for the girls 4x800m team that qualified for the State Meet, only return 2 of their runners in Emily Witt and Alyssa Williamson. The boys and girls teams both have some potential with some promising underclassmen looking to show their talents. Both teams still have high hopes for the season. Their first meet will be held on March 26 at Rose Hill District Stadium. After an extremely successful four year run in which a talented group of players recorded a 62-32 record and three consecutive 3rd place finishes at the State Tournament, the Rockets will be fielding a young and inexperienced team in 2018. With only three returning starters, the Rockets will surely go through some growing pains as the team gains experience. Senior Aaron Moore and Junior Braden Geer will lead an otherwise inexperienced pitching staff. The Rockets will depend on several sophomores and freshmen to contribute at the varsity level. The team will open their season at Circle on March 26th followed by their home opener against Clearwater on March 29th. After losing only 4 seniors from the 2017 team that placed 2nd in the AVCTL Division IV, the 2018 softball team will be a senior heavy team this season, as they will be led by 7 seniors. Returning All-League players include senior third baseman Jenna Anderson, junior first baseman Kylee Dunn, junior shortstop Emily Adler, and junior second baseman Sydney Adler. The Lady Rockets will return a lot of experience from a team that went 12-9 last year falling short of a state appearance when they lost in the first round of the substate tournament. With a lot of returning experience, the Ladies will be working hard trying to advance to State this season. The Lady Rockets will open their season at Circle High School against the Thunderbirds on March 26th. The Lady Rockets Swimming team is preparing to kick off the 2018 swimming season. Returning swimmers include Hannah Farber, Sarah Sissel, Kallan Lucas, Kennedy West, Emma Cunningham, Savannah Kiser, and Skyla Thomas-Frazier. The Lady Rockets hope to show growth as both swimmers and athletes. Last season the Lady Rockets sent Farber, T. Kaiser, Cunningham, and Sissel to the State Meet to compete in the 200-yard freestyle. The girls gained a lot of experience last season and are working hard for an opportunity to send even more girls to the State Meet this year. After struggling with numbers the past couple of years, the girls’ soccer team has combined with Douglas High School for the 2018 season. 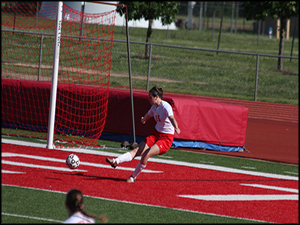 Last year the girls fielded an inexperienced roster and went 1-16 with one win over El Dorado. Due to the numbers, several jv games were canceled as underclassmen were forced to play varsity. This season, the Rocket’s roster is again composed of mostly underclassmen with 12 freshmen, 5 sophomores, 6 juniors, and 4 seniors. Returning seniors who will be leading the young roster include Kelsea Kill, Gabby Bentley, and Sarah Sissel. Also joining the team as a senior will be Kryslyn Henderson. The girls will face another difficult schedule but will be working hard to improve upon last season. The 2017-2018 wrestling season was the most successful in over a decade. The season was filled with accomplishments at all levels of the team. 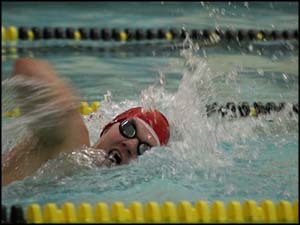 The varsity team broke multiple personal records including season records and post-season records. The varsity wrestlers won the AVCTL division 4 league title for the first time, their first league title since winning the CTL in 2002. The Rockets also had multiple wrestlers advance to the state tournament in Salina. Among these wrestlers were Kyle Sackett, Matt Atkinson, David Leck, Grant Scheer, Luke Culbertson, and Chase Thrush. Sackett, Atkinson, Scheer, and Thrush all brought home state medals and the Rockets placed 15th as a team. The Rockets fought hard and put themselves into a position to have their first winning record since 2007-2008. The Rockets celebrated team accomplishments like a dual record of 4-3, but they also celebrated several individual accomplishments. Several wrestlers celebrated 30+ win seasons; among them are Kyle Sackett (36-8), Grant Scheer (38-6), Ben Black (33-16), Chase Thrush (39-7), and David leck (36-11). The Girls Basketball team was expecting to have a good year, but they had a lot of holes to fill after several seniors graduated from last year’s 19-3 team. They did, however, return key players in Danyel Yardly, Emily Adler, Sydney Adler, and Sarah Sissel. The girls also had a key newcomer in Emma Cunningham, who could score and also dominate the boards if needed. The girls would start the year slow dropping their first 3 games, but would then go on a 5-game winning streak before losing a couple and then going on a 6-game win streak. 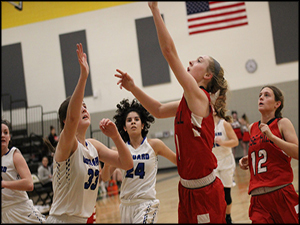 The girls would go into Sub-state as the 2-seed and would face a tough Andover Central team that the Rockets had narrowly defeated on the Jaguars home court earlier in the season. The girls would keep the game close but would eventually fall to the Lady Jaguars, finishing the season two games shy of a state appearance. This is the third year in a row the girls have had a winning record. The underclassmen will continue to work hard looking for a trip to the State Tournament next year. The Lady Rockets Basketball team will be bringing back seven players with varsity experience. The team graduated five seniors last year and is coming off a 19-3 season. The team will be smaller but faster then last year’s team and will lean on their returning varsity experience to lead them to success. Rose Hill will be expecting big things from all-league honorable mention players Emily and Sydney Adler while having the returning Coach of the Year Greg Welch. The girls will also have Sarah Sissel back, who led the team in 3-point shooting last year. Team strengths will be depth, versatility, and overall athleticism. The team is looking to play position-less basketball; all of the girls can handle the ball, shoot the ball, and make plays for others. The Lady Rockets are working hard to have a successful season and hope to qualify for the State Tournament. Coach Welch will be in his third season with the Rockets, having led them to a 32-12 record the past two seasons. The girls are looking forward to their first game of the season on December 1st against Augusta at home. The Rocket basketball team will experience a new type of gameplay this year. The coaching staff won’t change, but the Rockets plan to come with a more aggressive approach on the offensive side. The team will consist of four seniors as well as a few juniors and sophomores that will come in and help the Rockets on all sides of the court. Returning seniors are Dylan Sapp, Peyton Austin, Aaron Moore, and Cole Knight. Coach Shirley said this about his top players: “Koby [Campbell] had to be thrown into a tough situation as a freshman, where he started every [varsity] game for us... Dalton [Rapp] really started to come through for our team late in the season. He is very skilled and has a knack for rebounding… Dylan [Sapp] is extremely athletically gifted; he has a great ability to score the ball around the rim. Cole [Knight] is a gifted scorer; he has a great ability to get his shot off quickly.” Coach Shirley also goes on to praise the players’ hard work and focus over the summer. With a couple injuries on the team, other players will have to fill positions quickly in order for the team to come out on the topside. Although the Rockets aren’t the most skilled team, their goal is to be the toughest fighting team. Coach Shirley has high hopes for this year as he wants the team to fight for a trip to the state tournament. The 2017-2018 Rocket Wrestling team is hoping to fill weight classes and go to state this year. Despite last year’s dual record, the team is hopeful that hard work will lead to a successful season. This year’s rosters is a combination of new faces as well as returning members, who were previously very successful. Some returning members include Kyle Sacket, who placed 6th at state last year, Grant Scheer with a record of 31-10, Chase Thrush with a record of 30-8, Michael Diaz, David Leck, Ben Black, and Luke Culbertson. Also returning is sophomore Anayka Besco. Last year, Besco won the 2017 girl’s state championship. Head Coach Darian Eshelman is placing heavy responsibility and faith in his seniors to teach and mentor younger members. 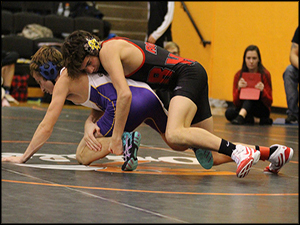 As the season progresses the team hopes to improve wrestlers and build champions. 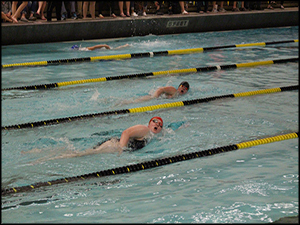 After a young Rocket Swim Team took 4 events to the finals of the state meet last year, they are looking to once again qualify several events for the state finals, but there are some obstacles to overcome. 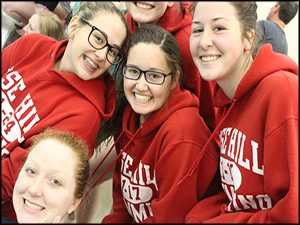 The team had a hard time finding a coach until the girl’s swim coach, Tessa Downs, agreed to coach the Rocket men’s swim team as well. Last year’s young, small roster of just 5 Rockets has increased to 8. 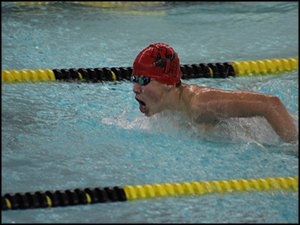 There will be 3 returning swimmers for the Rockets, 2 of which were state finalists last year: Junior Hayden Kalp and Senior Braden Bischler. They’re looking to take the younger underclassmen under their wings and lead them to another successful Rocket swimming season. The Lady Rockets started off the season going undefeated for 28 games in which they played at a high level blowing out several opponents. The Rockets would suffer some injuries causing them to lose their first game of the season to the McPherson Bullpups. While dealing with these injuries, the Ladies would also lose games to Douglass and Hesston at the Clearwater Invitational. However, they got healthy just in time for the Sub State Tournament and easily cruised to their sixth State Tournament berth in the last seven seasons. At the state tournament the Lady Rockets began pool play with victories over Bishop Miege, who they defeated in last year’s title game, and Basehor – Linwood. With two victories in pool play, they clinched their ticket to bracket play the following day, but still had one more game against Louisburg in pool play to determine seeding for bracket play. Louisburg proved to be an excellent team as they defeated the Lady Rockets in two sets. In bracket play, the Rockets first faced off against the Ulysses Tigers who they defeated in two sets to advance to the State Championship Game. It was no surprise that their opponent for the State Championship would be Louisburg. There was no doubt that the two best teams in the state were playing for the State Championship. The first set was a back and forth affair with several lead changes. However, Louisburg won the first set 25-23. Having now lost three consecutive sets to the Wildcats, including pool play the previous day, the Lady Rockets had their back up against the wall. The second set actually ended up being a dominant performance by the Lady Rockets as they easily won 25-10 to force a third set for the State Championship. The third set was one of the most exciting and intense matches you will ever see in high school volleyball. The lead changed several times and both teams had a chance to win the championship at the end of the set. However, it was the Lady Rockets who would finish the job and earn the hard fought 29-27 win for the State Championship over an excellent Louisburg Wildcat team. After winning back-to-back State Championships, the Lady Rockets will be losing a lot of talent. Graduating seniors are Emily Witt, Danyel Yardley, Sarah Lazar, and Hunter Gunnarson. The Lady Rockets have some young talent hoping to step up next season and help get the team back to the State Tournament. Coach Segovia has brought the program to a high level with two State Championships, 6 state appearances including a third place finish in 2012 and a 4th place finish in 2013, 4 league titles, and she now boasts a 235-65 record with a .783 winning percentage over seven seasons. The Rockets season started out rough due to a lack of experienced seniors. The varsity boys lost the first four games straight. However, they were determined to stop losing. The next five games were wins for the Rockets. They battled back and proved that they were not going to roll over this season. As the season continued most games resulted in wins; however, some losses and ties were scattered in. They battled hard the entire season. For 4A Regionals they were matched up against Berean Academy, who they had defeated 3-2 earlier in the season, at Berean. The game was extremely close the entire game. Both teams were stuck at one score each. The game went into four overtimes, as the score remained 1-1. After the 4th overtime ended, they would proceed to a shootout to determine the winner. Berean shot first, resulting in a make, miss, make, make, and a miss. 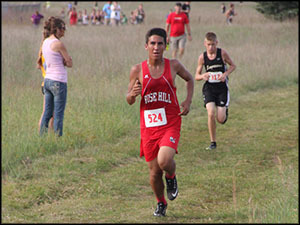 Rose Hill followed with kicks from Cobb, Dinkel, Bradley, and Austin. Despite their efforts, Rose Hill only made 1 of 4 shots ending their season with a record of 9-7-1. 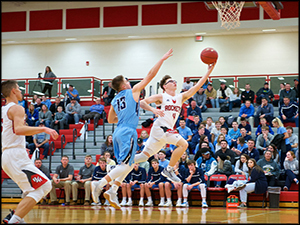 The Rocket will be losing several seniors off of this year’s team including Kaden Kochick, Peyton Austin, Tanner Williams, Corbyn Jones, Garrett Guinn, Zeb Bradley, Vlad Bendarchuck, Franz Lienemann, and Jarrett Grier. The team had hoped to go farther into the postseason but is excited for the potential of next year’s team. What should have been a promising season ended in disappointment for the Rockets with a 1-8 record. After experiencing success over the summer, the team knew that they could be really good. However, the issue was depth and in order for the season to go well they had to avoid costly injuries. Unfortunately, this did not happen. Early in the season the Rockets were plagued by several injuries changing the roster drastically. Several young kids stepped up to do their part at positions they have never played before. When one person was supposed to come back, another would go down. As the season progressed and kids got more and more worn out it reflected on the field. Due to a lack of numbers and several injuries, many starters were forced to start playing both ways during games. Unfortunately the 2018 seniors were unable to leave the way they wanted, although they learned a lot about life from the coaches. Seniors who will be leaving the program include Nathan Ast, Dylan Sapp, Broc Heiskell, Nolan Ast, J. J. Carney, Cody Wallis, Braden Bischler, Luke Culbertson, Owen Kimbell, Chase Thrush, Zach Blessant, Peyton McNeil, and Sarah Sissel. The football program has suffered through some rough seasons since winning the State Championship in 2011. In order to become competitive again, the program needs to increase their numbers to the point where there are both freshmen and JV games on Mondays instead of just one freshmen/sophomore game. The program does have several younger talented players to build around but more are needed so that injuries that are common to this game do not devastate a season like they did in 2017. 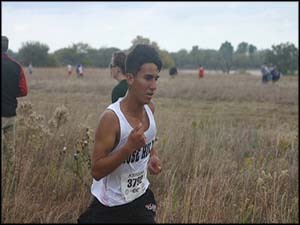 The Cross Country team dealt with several injuries this season, but the team had success with the runners that they had available. The team unfortunately did not make it to State, but the team consists of many underclassmen with great talent. Seniors were scarce but the influence they had led the team to be the best they could. For the boys, seniors Shayne Henry and Matt Atkins led the boys. Leading the girls team were seniors Nicole Picard, Alyssa Williamson, Megan Leach, and Sarah Sissel. Top runners for the season included juniors Kyle Sackett and Trenton Nusz, and sophomores Sage Nottingham and Maddie Bryant. Each of these runners placed consistently high throughout the entire season. The best time for the boys came from Sage Nottingham with a time of 19:07.8 at the Winfield Invitational, and the girls fastest time was 23:27.8 again from the Winfield Invitational by Maddie Bryant. Next season the Rockets just need a good turn out in order to compete with some of the best teams. 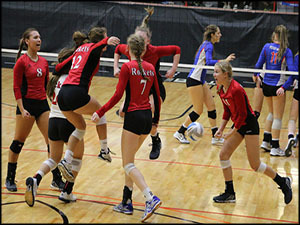 The Rocket Volleyball team is looking to make another run at a State Title after winning their first ever Volleyball State Championship last year. The girls are looking to take this season one game at a time. The Rockets lost seniors Jaden Heinz, Rachel Salazar, Brandy Vaughn and Anna Van Driel from last year’s team but will be returning key players Emily Witt, Danyel Yardley, and Gracie Van Driel. The team will also have experience coming from the bench and will be expecting younger players to step up and play a big role this season. Coach Segovia is expecting the foundation of this year’s team to be hard work and teamwork. Coach Segovia believes these key features in her team and with the girls working hard all summer will lead to a successful season. The Rockets open up the season on August 29th when they travel to Circle to take on the Thunderbirds and the El Dorado Wildcats. 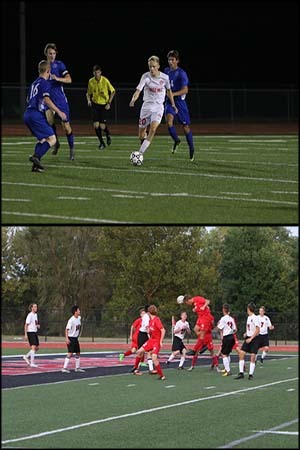 After a .500 season, the Varsity boy’s soccer team is looking to have a great season. The team hopes to return to the level they were playing when they won back-to-back State Championships in 2014 and 2015. This year only five returning seniors will be playing. Captain Tanner Williams said, “The team has potential”. They hope that despite not having several returning starters they will be able to have a successful season. With the arrival of foreign exchange student Franz Lienemann from Hamburg Germany, things are looking more hopeful as far as offensive scoring goes. The boy’s team will hit the road to take on the Coffeyville Golden Tornadoes in their season opener on August 25th. Be sure to come out and support the team on August 31st when they take on the McPherson Bullpups in their home opener. The Rocket Cross Country Team is looking to start new season off strong. Boys Cross Country has few returning runners, but are looking tough and will put up a fight. The girls team, just like the boys team, has fewer runners than last year. Although neither team made it past regionals last year, Coach Barger says this year will be a building year for the girls while the boys are looking to push their potential. The boys varsity will mainly be underclassmen, including Trenton Nusz (Jr), Sage Nottingham (So) and Drew Leck (Fr). Meanwhile, the girls varsity will include Nicole Picard (Sr), Alyssa Williamson (Sr) and Maddie Bryant (So). Some of the tougher courses these runners will participate on include meets at Buhler, Goddard, and Wamego, which is where the 4A State Cross Country meet will be held. After a couple of difficult seasons, the Rocket football team is looking to continue their improvement. Coach Boese wants the players to “Be Great” and they have the personnel to push the program back in that direction. The Rockets return a lot of players with experience as this senior class has had to play varsity since they were sophomores. The Rockets will return many starters, including five offensive linemen who all started at some point during the season last year. An experienced backfield will also be returning for the Rockets. 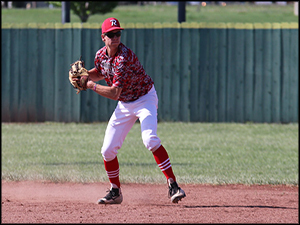 Nolan Ast (SR) returns to the Rockets after he and his brother, Nathan, spent the past two seasons in Texas. Nolan was set to be the Rocket’s QB as a sophomore before the family moved late in the summer. 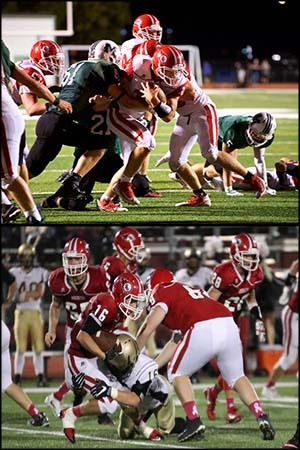 After a very successful summer, team captains Cody Wallis, Braden Bischler and JJ Carney are looking to lead the Rockets to a winning season. The Rockets will open their season at home against Collegiate on September 1st.